Underground electronic producers Beatrice Dillon and Kassem Mosse collaborate on a semi-improvised live set, built of electronics and field recordings. First performed at Tate Liverpool in the UK in 2015, this new collaboration bridges the gap between listening and dancing, and combines their shared interests in live processing, experimental electronics and environmental and ethnographic field recordings. 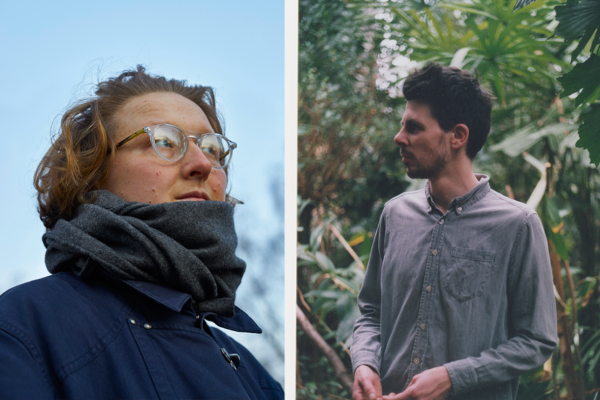 Two of the most exciting electronic producers working in Europe at the moment, Beatrice Dillon and Kassem Mosse create two different flavours of shape-shifting experimental techno, with feet firmly planted in both fringe soundworlds and on the dancefloor. Alongside their live manipulations of original field recordings, rhythm samples and layers of sound they´ll be DJing a kaleidoscopic journey through jazz, world, dub, techno and house. London born and based Beatrice Dillon is a producer, composer and a DJ at the radio station NTS in London. Her mixes are an esoteric antidote to orthodoxy, tracing the fringes and the vaults for sounds lesser heard, from wayward techno to vintage Folkways. Kassem Mosse produces electronic music and thinks too much. He lives and works in Leipzig, Germany. Presented in collaboration with Landmark.